The ocean is one of the most mysterious things on our planet. As adults our fascination with the ocean and its many living things is unstoppable. Imagine how fascinating it is for our little ones. Oceans contain 99% of the living space on the planet and less than 10% of that space has been explored by humans. The average depth of the ocean is 3,795 meters. The average height of the land is 840 meters. Scientists have named and successfully classified around 1.5 million species. It is estimated that there are as little as 2 million to as many as 50 million more species that have not yet been found or have been incorrectly classified. Draw a few ocean animals on a paper plate (like fish, seahorse, starfish) and cut them out to shape. To create the ocean, fold the blue tissue paper in half and cut long strips out then glue or tape to paper plate. Paint the ocean animals and lay them out to dry for a bit. Then attach toothpicks to the back of the animals using tape. 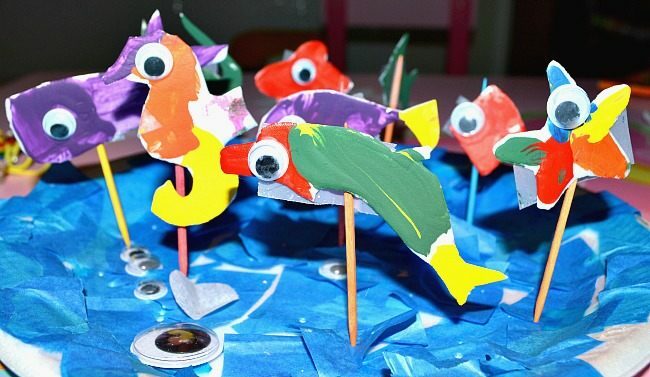 Add googly eyes to your ocean creatures. Attach the animals to the ocean by pricking the toothpicks on the plate. © 2013. Little Crafter, LLC.